Recently, the European Union Agency for Fundamental Rights (FRA) released a new report on the transition from education to employment of young Roma. The report compares the situation in nine EU Member States (Bulgaria, Croatia, the Czech Republic, Greece, Hungary, Portugal, Romania, Slovakia and Spain) between 2011 and 2016. It finds out that although education has slightly improved, the employment situation for young Roma, especially women, barely changed. Young Roma remain trapped in a vicious poverty cycle leading to poor education and job prospects. The report analyses three groups of Roma aged 16-24: those who are in education, those who are in employment and those who are neither in employment, education or training (NEETs). Whether Roma are in education or employment and whether they have quality jobs depends on socio-economic and socio-demographic factors that the report explores. The EU Agency for Fundamental Rights concludes that tackling discrimination, exclusion and anti-Gypsysim is key to encourage Roma participation in education and enhance the chance to find better and more secure jobs, leading to better life opportunities and greater social inclusion. 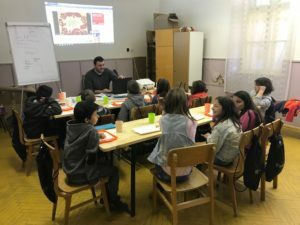 Eurodiaconia member organisations are very active in several European countries to support young Roma to have access to better education and to increase their chances to enter the job market. Based on their experience, Eurodiaconia has also recently published a policy paper with recommendations aiming at better social and economic inclusion of Roma people. To know more about the findings of the new FRA study, please read the full report.